They say when in Rome…. 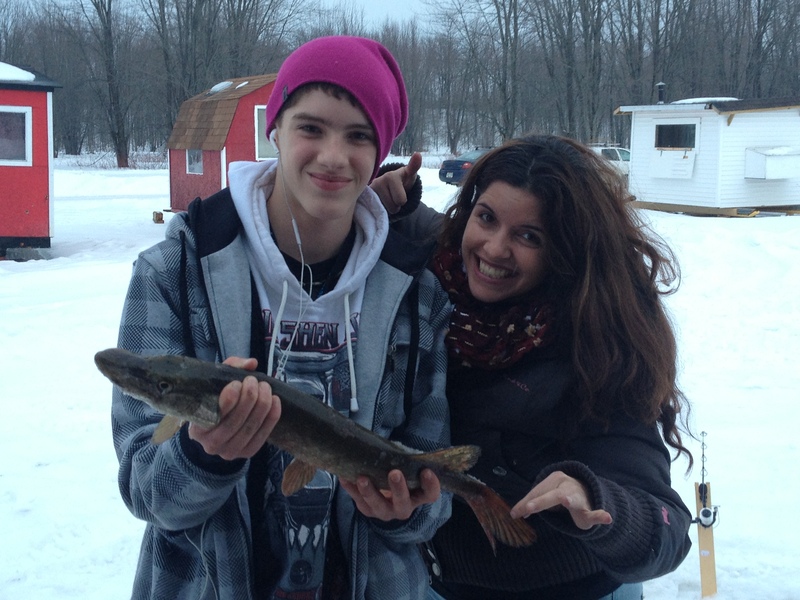 Ok, maybe I took it to a whole new next level, but I am Cuban, live in Ottawa and I own an ice fishing shack. I come from a country where (literally) people won’t go to work if it rains. I moved to Canada in 2005: looking for a better life. Totally ignoring I was moving to the 2nd coldest capital city in the world. Ottawa Winter are nasty cold. The first time – 20 C hit, not going to work was not an option. And people looked at me weird when I suggested that not going to work in that weather should be added to the office’s best practices. Very soon I had to trade my cute high heel boots for a pair of mama bear ones. I then got an ‘astronaut’ coat, as someone told me without it I was not going to survive Canada’s Winters.I was ready but not yet happy. I had nothing to do during the frozen weekends. A couple of years passed and my then 8 year old son developed this passion for fishing. I thought fish just froze in the Canadian Winter, but life proved me wrong. Canada’s fishes don’t freeze! They are as tough and sturdy as the human citizens of this country. It can be -20 or -30 C and they still swim and look for food as if their lakes were in the Caribbean. So, lucky for Canadian fishermen and ‘fisherwomen’ the frozen lakes offer a place where put a little shack, open a hole, and fish away! To me, a great opportunity to put my astronaut gear and mama bear boots to good use. 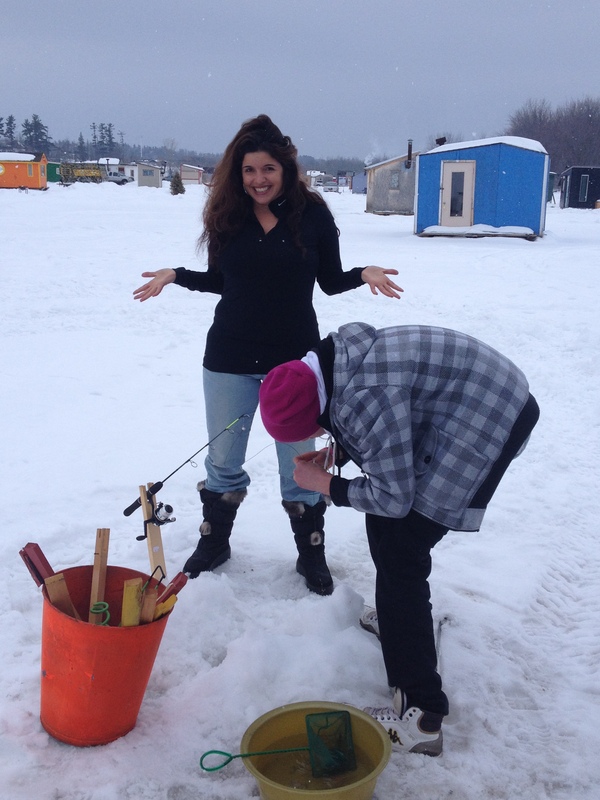 So as a good adaptable Cuban I am, I bought an ice-fishing shack for me and my son to go fishing. I got it from a fisherman who was ‘moving lakes’. That made me laugh but apparently something you can do if you have a truck and want to move your shack from one place to another.The fisherman left me with all this gear that were supposed to be fishing rods. Minuscule little rods you just still in the ice to fish while you sit around, drink beer (or rum in my case) and wait. He stuffed the minuscule fishing road in the ice, attached a hook to the rod, said a bunch of other things I didn’t catch and ended with ” then you just wait for a fish to bite’. The he left. I was in the middle of nowhere with my son freezing my soul waiting for that fish to bite. I suggested we went back in the shack and looked through the window to see the fish bite. My son discovered the shack had a furnace and he started a fire with some wood that was there. He did that in no time, almost as if he was a caveman and had instincts I didn’t have. He just knew how to work that furnace and aired that little fire into a big one in no time. Ten minutes passed and we were so nice toasty inside that place. We chatted and laughed for hours. He also taught me how to cook marshmallows. I must have eaten 20 of them. How didn’t I know about marshmallows before? Why didn’t I have an ice fishing shack all my life? Oh! because in Cuba there are no frozen lakes, that’s why. We caught a fish! 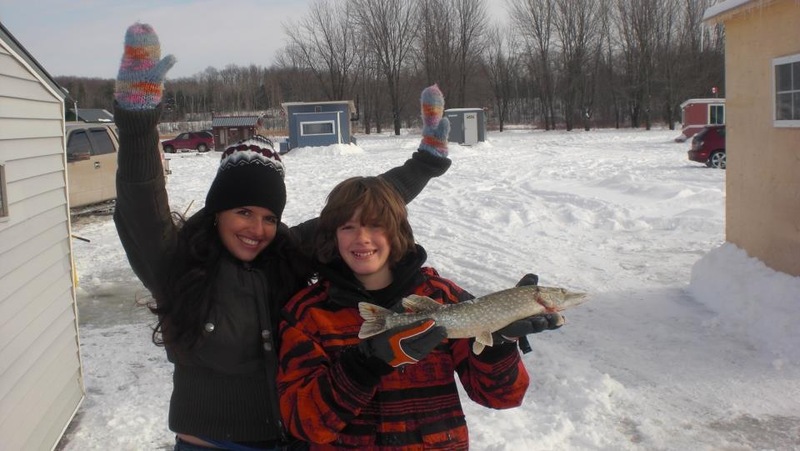 our fist fish ever in a frozen lake! We were so proud! The furnace served for more than heating us up. We cooked our fish on top of that thing. It tasted so yummy and fresh. And ever since that day, I’ve been hooked with that shack. Maybe I am the only Cuban girl in this world that owns one. Even my Winter-savvy Canadian girlfriends don’t own an ice shack!! They don’t know what they are missing, because, believe me. It’s fun!! Entrada siguiente Deep inside the Cuban lens: That moment when you suddenly care about Cuba. Jocy muy bueno tu blog. Ya puedo alardear que yo he ido a pescar con la unica Cubana que tiene un casucho de pescar en el hielo. Saludos! Única en el mundo fíjate! que no quede duda! jejeje…. bueno al no ser que salga otra Cubanita por ahí a quitarme el trofeo!